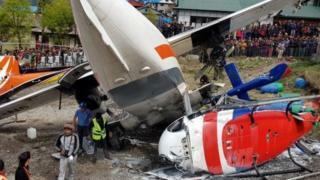 Three people have died in a plane crash in Nepal, at what is regarded as one of the world's most dangerous airports. The reason for Saturday's accident is not clear. Officials said the weather was good and flights later resumed their operations. Eyewitness Bikram Raj Bhandari told BBC Nepali: "I heard an explosion from some distance and ran towards the airport to see what had happened. There was smoke all around." The world's most dangerous airport? However, Nepal has a poor flight safely record. In February, seven people died in a helicopter crash, including the country's Minister of Culture, Tourism and Civil Aviation Rabindra Adhikari. Nepal plane crash: Were poor communications to blame?